This article gives an overview of how you can use the traffic setting features of your Attribution.io account to re-organize and re-sort your traffic to make it more transparent and predictable. Most of these features build off the platform's standard traffic handling, which you can read about in Part 1: Traffic Parsing. All of the traffic customization tools discussed below can be found in your Traffic Settings page in your Attribution.io account. All new accounts include 5 mediums out of the box: Paid, Emails, Organic, Social, Referral and Direct. You can customize your mediums at any time and add sources to fill them out. For example, if you do tons of mobile push notifications, you could make a new medium called Push and sort traffic into various types of push notifications. Sources define individual sources of network traffic, usually other sites or services. You can use utm_source tags or domain patterns to easily sort traffic. Every new account gets a handful of prebuilt sources for common traffic sources like Google and Facebook. Is your site entirely on a single domain or do users common transition between domains? For example, most Shopify stores exist on one domain, shoes-shop.com, and use another domain for purchases, checkout.shopify.com. In this case you can set your domains to include both, so that when a visitor arrives to either domain it will be considered 'Direct' traffic and get sorted into the Direct medium. Without setting your domains in this way, traffic from one domain will be considered 'Referral' and will be sorted into the referral domain. checkout.shopify.com/12312312312/checkout/purchase: The order ID is baked right into the url, making it tough to combine all the purchase pages at once. bigTime.hosted-website.com/launch.index: Pages that are hosted on a 3rd party domain can be tough to cleanly organize into your site traffic. Tag and URL rules allow you to massage difficult URLs, like the above, into a simple standard structure. URL Rules let you change the URLs that we process for easier reporting and organizing, without ever changing your actual live urls. It's a great and simple way to remove unique values and ids from urls and standardize their structure. 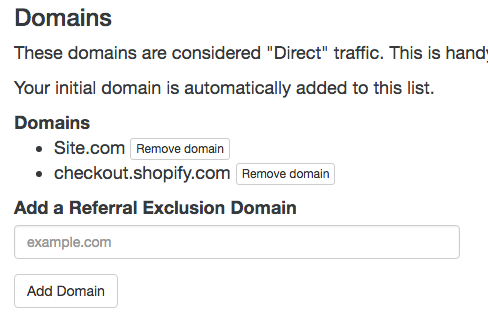 For example, for all Shopify stores we work with, we remap the 4 stages of the checkout flow into the same URL. For example, XYZ becomes ABC. 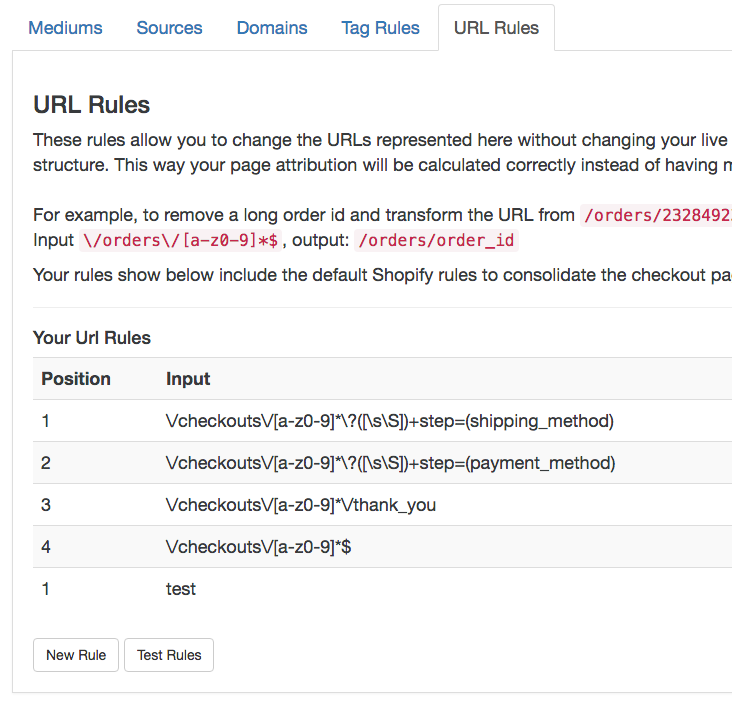 Tag Rules let you change the URL parameters on the fly. Often links get launched with incorrect tagging or 3rd parties force a specific tag structure. 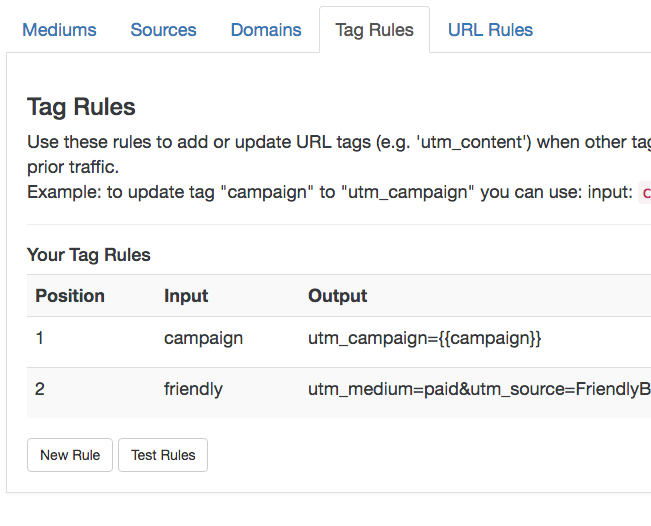 Tag rules let you easily add standard UTM tags to organize your traffic without worrying about changing your live rules.